M-commerce has continued to evolve in recent months as consumers experiment with how the technology fits into their purchasing habits. M-commerce has grown over time, with an increasing number of consumers using their mobile devices to research and make online orders. However, certain branches of m-commerce have yet to be embraced by consumers in Western countries, where the technology is relatively new. For instance, 56 percent of consumers in the U.S. don’t prefer mobile payment methods, according to a survey conducted by Kantar TNS. Mobile payments, often referred to as “mobile money,” allow consumers to make payments from their phone, most popularly by tapping the phone to a card reader. They often come in the form of platforms in which the mobile device holds credit or debit card information to act in lieu of that card. 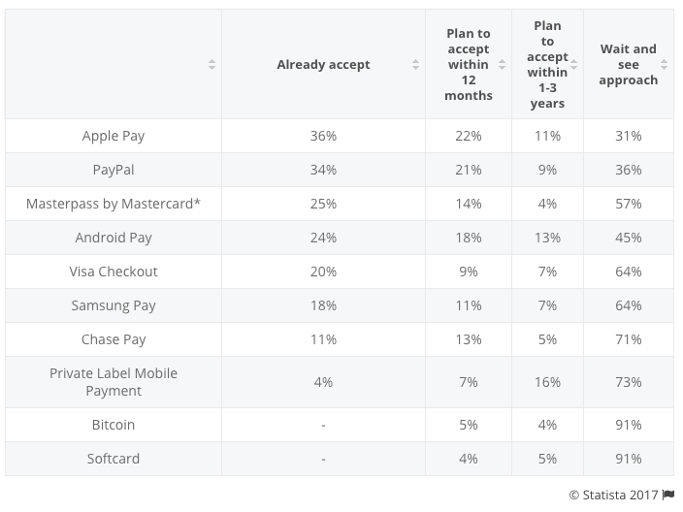 Companies such as Apple, Android, Mastercard and Paypal all offer mobile payments. Many mobile payment platforms require specific receptors, which often must be purchased and installed by retailers, in order to properly make a purchase. The willingness and ability of vendors to install these receptors is currently the biggest barrier of entry for mobile payments to properly enter the market. Apple Pay is currently the most accepted mobile payment, with 36 percent of American retailers accepting it. However, for many other payment methods, retailers are choosing to wait and see how the market acts before making the adjustments. There are certain markets however, who don’t follow the trend of resistance towards mobile payment platforms. Estimations from eMarketer predicts nearly 78 percent of smartphone users in China will use a mobile payment platform in 2018. Of the 56 countries surveyed in the Kantar TNS survey, only China and Mongolia had a majority of participants say they prefer to use mobile payments at 64 and 63 percent respectively. Dirxion offers app development for both the Google Play and iTunes stores. Within the apps, customers are able to view a business’s online catalogs or download them for offline viewing. Dirxion can also integrate online catalogs into an existing application. Companies without a dedicated e-commerce mobile app benefit from an audience built from a Dirxion online catalog app. Companies have a direct avenue to a captive audience of customers via push notifications which can inform of new catalog releases, upcoming sales and other pertinent company news. Mobile e-commerce has grown at such a fast rate that economists have given the specific brand of online shopping its own name: m-commerce. According to an article recently published by Forbes, m-commerce spending is projected to reach $284 billion by 2020 and account for nearly half of all e-commerce. Because of this boom, however, m-commerce has encountered hardware and software limitations that can potentially break the shopping experience for consumers. As reported by Business Insider, in Q2 2015, U.S. adults spent 59 percent of their time on mobile devices but spent only 15 percent of their money there. The mobile conversion rate for U.S. citizens shopping on their smartphones in Q4 2016 was 1.55 percent as compared to 4.14 percent for desktops. Smaller screen sizes can make for a frustrating shopping experience, sometimes getting in the way of browsing or entering payment options. Many companies don’t have optimized websites for mobile viewing. Conversion rates and time spent on a particular device don’t necessarily paint the entire picture though. 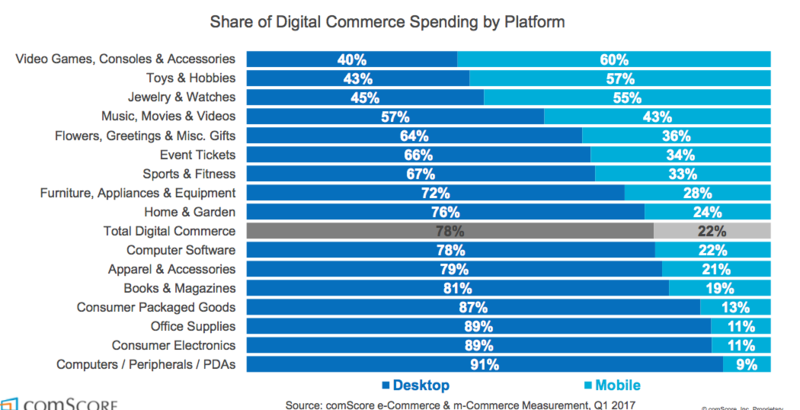 According to comScore, items bought online are “weighted” differently depending on the means of purchase. For instance, 57 percent of items categorized as “Toys & Hobbies” are bought on a mobile device, and 89 percent of “Consumer Electronics” are bought on a desktop (as of Q1 2017). Despite this division of the m-commerce market, consumers overwhelmingly prefer to use dedicated apps as opposed to using a browser on their mobile devices. According to Flurry Analytics, a mobile apps analytics tool owned by Yahoo!, 90 percent of the time a person spends on their phone is within apps. Companies like Amazon have taken the lead on m-commerce app development. Amazon revealed 72 percent of their customers shopped using a mobile device during the holiday season, a 56 percent growth worldwide. Amazon has taken into account the cramped nature of some smartphones by developing augmented reality features and allowing customers to shop via Alexa-based hardware. To meet the growing demand of the m-commerce market, Dirxion offers custom app development for the Google Play and iTunes stores. Within the apps, customers are able to view a business’s online catalogs or download them for offline viewing. The catalogs, when accessed while the phone is online, are completely interactive and optimized with HTML5. Dirxion can also integrate online catalogs into an existing application. Such is the case for Dirxion customer Ulta Beauty, where eflyers published with Dirxion have been integrated into their shopping app to create a streamlined and seamless buying experience.